The most complete package of tools for your PC problems. 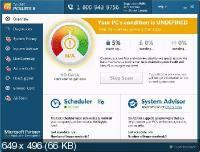 PCSuite runs a complete checkup of your entire system locating junk files, speed-reducing issues and causes of any system or application errors or crashes. Through a lot of research and testing, we have worked out precise techniques that allow locating issues, which can be safely removed with no risk of damaging your operating system. A clean PC means better efficiency We designed the cleaning module in PCSuite to sweep out all types of PC junk, such as unneeded system and user temporary files, web browser cache, unused error logs, leftover Windows Update files, temporary Sun Java files, unneeded Microsoft Office cache and a lot more. It helps reclaim gigabytes of hard disk space on an average PC. Errors and crashes are a thing of the past Like an experienced surgeon, PCSuite employs precision tools to carefully remove corrupt keys and invalid entries from the Windows registry taking care not to damage anything vital. We have tested our software ensuring that it repairs the causes of most errors and crashes to restore smooth and stable performance with no side effects. Everything on your PC works faster PCSuite tweaks non-optimal system settings to help most processes and operations go at a faster pace. It adjusts internet connection settings to ensure smooth browsing, faster downloads and better audio/video call quality. We want you to have a great PC experience, so we included tools to speed up every aspect of your PC’s operation. Your system is more secure from hackers Most of us are concerned about personal information getting into the wrong hands. When you enter passwords or credit card details, this data is saved on your hard drive, invisible to you, but easy prey for a skilled hacker. We included privacy tools that help eliminate traces of your activity and safeguard your sensitive personal information. Set-and-forget scheduling convenience With PCSuite you can schedule automatic maintenance that detects and eliminates problems in real time protecting your performance and keeping your PC running at top speed. Knowing how busy your life can be, we created this functionality so you can set it once and have your PC auto-cleaned and accelerated on a convenient schedule. Your PC stays fast and stable for all your tasks To boost the effect you get from complete optimization, we have added automatic memory and processor management, which ensures that your active applications always have maximum resources allocated to them. This protects smooth and fast performance in real time and lets you have a consistently great computer experience every day. 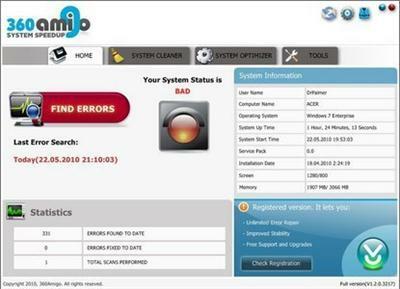 360Amigo System Speedup PRO 1.2.1.8200 Portable Multilingual !